living room at les terrasses. our pool at Les Terrasses. 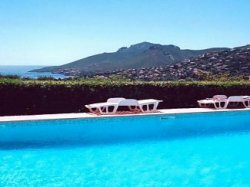 The tranquil, clean, and well equipped apartment, which sleeps 2 to 6, adjacent to the pool, has it's own private terrace with a patio garden and is on the south facing slopes of the breathtaking Esterel mountains, over looking the sea. Only twenty minutes from Cannes, and forty minutes from Nice Airport.